An operating system (OS) is the centerpiece of electronic control unit (ECU) software. We’ve been developing automotive-grade operating systems since 1997. Whatever your project needs, we have an OS that fits—starting from small, single-core, OSEK-compliant ECUs up to multicore and functional safety ECUs based on the latest AUTOSAR standards. 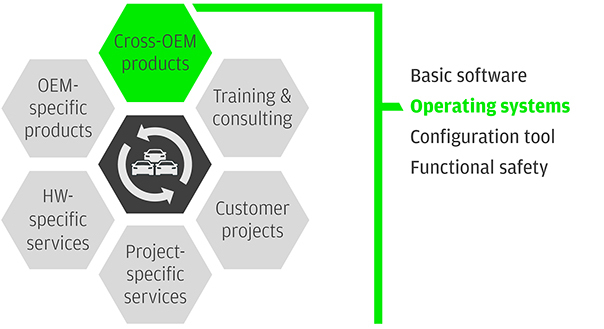 We offer the right OS for each kind of project, whether you need OSEK with small footprint; single-core or multi-core architectures for AUTOSAR; or you need to meet the ASIL A-D functional safety requirements according to ISO 26262. Our AUTOSAR and safety operating systems seamlessly integrate with our basic software, EB tresos AutoCore, and tool environment, EB tresos Studio. Our long-term partnerships with leading semiconductor manufacturers enable us to stay on top of new developments so that our operating systems consistently support the latest features. EB tresos AutoCore OS is an embedded real-time operating system that implements the latest AUTOSAR standard and all its scalability classes, including memory protection. It is available in single-core and multicore versions. To reduce the memory footprint and CPU run-time, the OS can be optimized at source level to remove all OS components that are not used in the given configuration. The code generation can be triggered from the graphical configurator EB tresos Studio and the command line to allow incorporation into existing build environments. 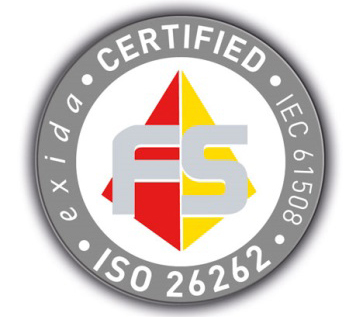 The single-core version has been independently certified by the assessment agency exida, ensuring that the product and development processes comply with the relevant safety management and design requirements of ISO 26262 ASIL D and IEC 61508 SIL 3. EB tresos Safety OS Multi-Core is the first of its kind in the automotive market. It paves the way for future automotive electronics trends by supporting multicore ECUs at ASIL D, the highest Automotive Safety Integrity Level. This is our OSEK/VDX-compliant embedded real-time operating system for small applications like bootloader or non-AUTOSAR projects. It perfectly fits to small 8- and 16-bit microcontrollers. EB tresos operating systems are a reliable base for the latest car applications. They are available for single-core and multicore systems. Our basic software for AUTOSAR-compliant ECUs. Our AUTOSAR-based basic software which complies with functional safety/ISO 26262. Our basic software package for OSEK/VDX-compliant ECUs.